Published: Dec. 9, 2018 at 06:44 p.m.
Oakland Raiders quarterback Derek Carr fumbles the ball and Pittsburgh Steelers cornerback Mike Hilton recovers for the Steelers. 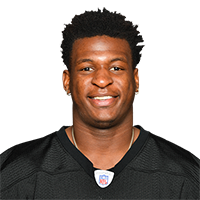 Published: Sept. 24, 2018 at 09:27 p.m.
Pittsburgh Steelers linebacker Jon Bostic bats Tampa Bay Buccaneers quarterback Ryan Fitzpatrick pass as Pittsburgh Steelers cornerback Mike Hilton comes up with a red-zone interception. Published: Sept. 24, 2018 at 09:19 p.m.
Tampa Bay Buccaneers wide receiver Chris Godwin fumbles the ball after Pittsburgh Steelers cornerback Artie Burns forces the fumble and Pittsburgh Steelers cornerback Mike Hilton recovers. Published: Nov. 16, 2017 at 08:48 p.m.
Tennessee Titans quarterback Marcus Mariota soars a pass over wide receiver Rishard Matthews' head, and Pittsburgh Steelers safety Mike Hilton intercepts it.